In 1935 the Santa Fe inaugurated its premier first class sleeping car only train the "Super Chief". The "Super Chief", often referred to as "The Train of the Stars", was frequently patronized by Hollywood stars because of its fine accommodations, fine dining and fast 39 hr 45 min trip between Chicago and Los Angeles through the rich scenery of the American Southwest. Setting a new standard for luxury rail travel, it quickly became the most recognized train in the United States with its sleek silver and red warbonnet painted F units in the lead. 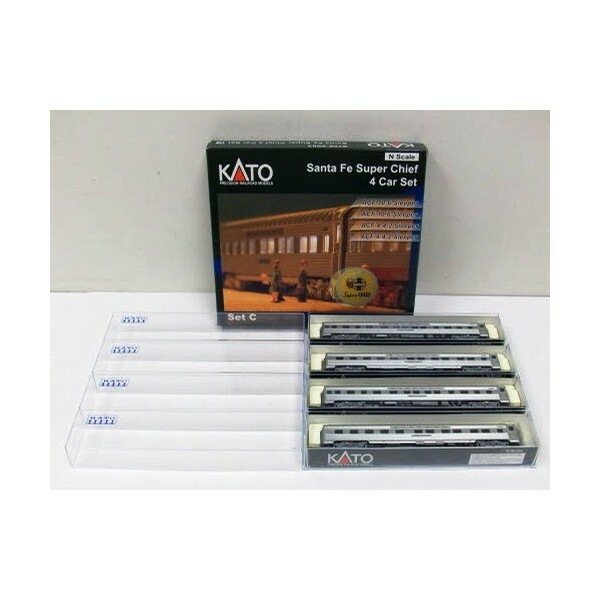 In the late 50's, the Santa Fe would run the Super Chief and El Capitan as a combined train, with consists that could vary but were often upwards of 18-20 cars. 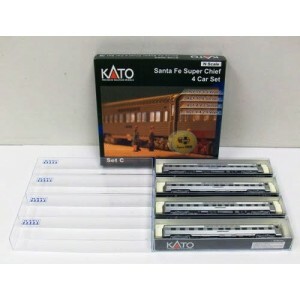 Kato USA has put together a small video presentation featuring this combined consist, as accurately reproduced using cars from both of the classic name train series sets and their supporting add-on packs of cars. Each car has a beautiful "stainless steel" body. The 2019 re-release will be accompanied by a traditional pair of F7 locomotives available for the first time with factory installed DCC and DCC+Sound Options!